Chesterwood is currently closed for the winter season of 2018-2019. We will re-open to the public weekends in May, and then open from May 25th through October 27th daily from 10 a.m. to 5 p.m. Download the property map. Please look at our calendar for special art exhibitions, lectures and book signings, and benefit events that continue to educate and promote Daniel Chester French and Chesterwood all year long. Regular admission is $20 for adults; $10 for children 13 to 18; under 13 free. Grounds fee is $10 for adults; $5 for children 13 to 18; and free for children under 13. Special discounts are offered for seniors ($19); active military ($15); college students with ID ($15); and National Trust for Historic Preservation Members ($10), and admission is always free for members of NARM and Friends of Chesterwood. Please note that non-service dogs are not allowed on the property. American Icons discount ticket program: Chesterwood, Norman Rockwell Museum, Hancock Shaker Village and The Mount have joined together for a special discount admission program. After purchasing a full price ticket at your first museum, use your receipt to get $3 off each successive museum, for a savings of $9 off all three! Includes the residence, gardens, exhibit gallery, hands-on art activities for kids, museum shop, picnic area and walking trails. Most of the estate is accessible to persons with limited mobility including the studio, barn gallery and residence. The paths are fairly level and covered with pea stone. Chesterwood is a historic site of the National Trust for Historic Preservation, the former summer home, studio and gardens of America’s foremost 20th century public sculptor. Daniel Chester French is best known for Minute Man, 1874 (Concord, MA) and the seated figure of Abraham Lincoln for the Lincoln Memorial, 1922 (Washington, DC). French's public sculpture work can be seen throughout the United States and even abroad. Visitors to Chesterwood will experience the life and work of this prolific and successful artist from May through October, when the French family resided in the Berkshires. It is an excellent example of creative placemaking by an artist who planned and created what he considered to be a paradise for him and his family. While participating in highlight tours as well as open touring hours of the buildings, grounds and collection, visitors of all ages will enjoy exploring this site for creativity and inspiration designed by French in conjunction with the classical architect, Henry Bacon, as well as the well-known ornithologist, William Brewster. 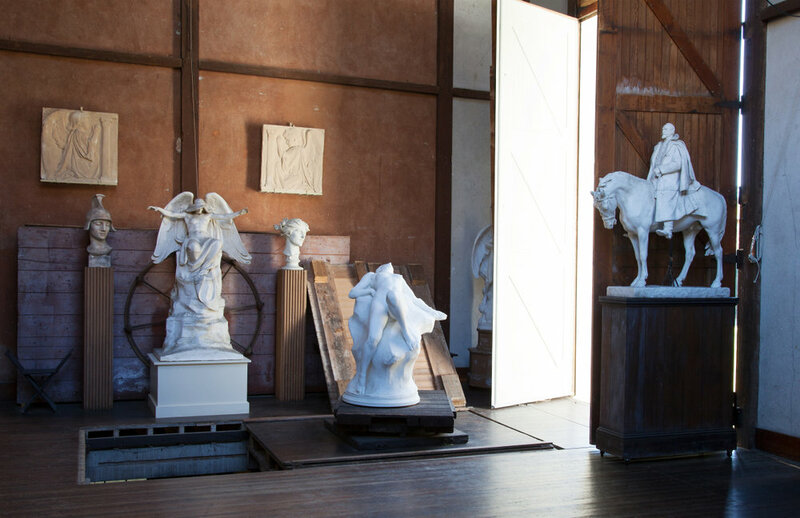 Hundreds of French's preliminary models and final works in bronze and marble are on view in the artist's impressive Studio, the Barn Gallery and a new study gallery of his sculpture and paintings funded by the Henry Luce Foundation. The formal Studio gardens and woodland walks also offer a quite respite in harmony with the man-made and natural surroundings. Throughout the season, special activities and programs are planned including a contemporary outdoor sculpture show (late June - early October) with a map identifying the artists and their work, guiding you around the property as well as a scavenger hunt for families. Other programs include drop-in art activities and art classes conducted by teachers from IS 183 Art School; demonstrations and workshops; lectures and presentions as well as open studio days by artists-in-residence. Guided group tours for 10 or more are available May 1 – October 31 by advance registration only. The summer estate of Daniel Chester French (1850-1931), sculptor of Abraham Lincoln for the Lincoln Memorial, is one of the hidden gems of the Berkshires. Be the first to see French’s recently rehabilitated studio, tour main rooms of the residence, and explore the formal and woodland walks with spectacular views. Discover how contemporary artists continue to be inspired by French. Groups can picnic, order lunch, or request a private wine and cheese party on the Studio’s piazza, overlooking Monument Mountain. Please call Margaret Cherin, Manager of Marketing and Business Operations, at 413.298.2034 to schedule a group tour. We recommend 10 or more people for group tours and ask that group leaders book at least one week ahead of time. Thank you.